As it needs the German Economics Minister to confirm what everybody had suspected anyway, I wonder if it will need a US counterpart to say the same about the ECB. The U.S. Federal Reserve is also active in currency markets, German Economics Minister Rainer Bruederle said Friday. Just in case there are still some die-hard folks out there - most likely members of the banking industry - who think this crisis does not stem from easy money handed out by irresponsible central banks to even more irresponsible commercial banks. Bury it. 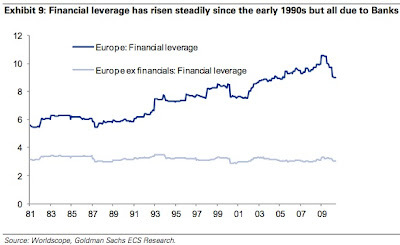 Even Goldman Sachs finds the rough doubling of leverage in the last 3 decades an outstanding event, although it fails to draw any conclusions in its latest European portfolio strategy document, dated May 27, which displays this graph on page 8. 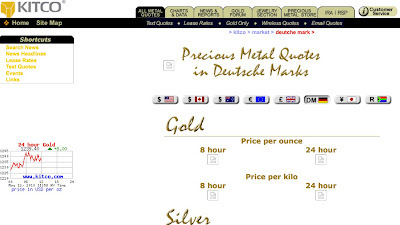 A web page of precious metals prices provider Kitco.com has sparked rumors that Germany will leave the Eurozone and reintroduce German Marks, sending gold to a new record of $1,244 and silver to a multi-year high of $19.64. 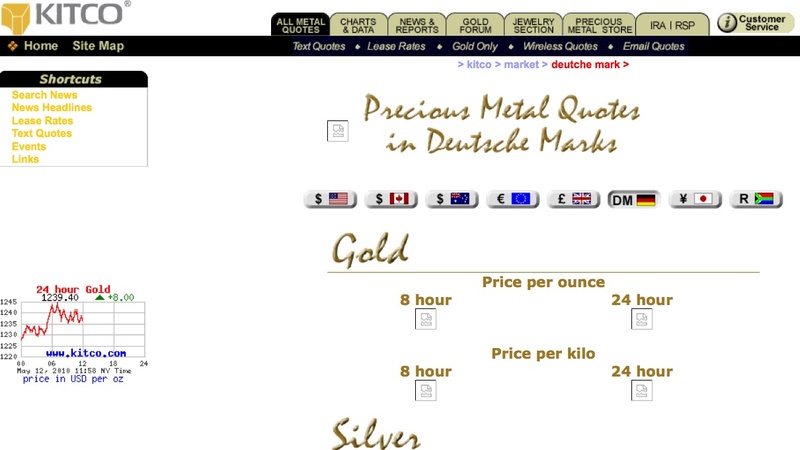 It is this half-ready page shown below that has created excitement as it lists precious metals in Deutschmark units. 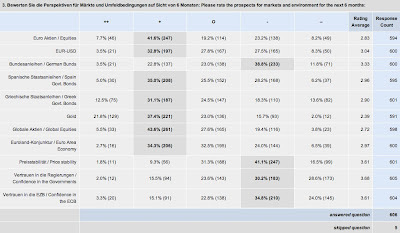 German website Silber.de had another market-sparkling comment from a forum participant who said goldprice.org has reintroduced a DEM option since about a week. Check it out here. 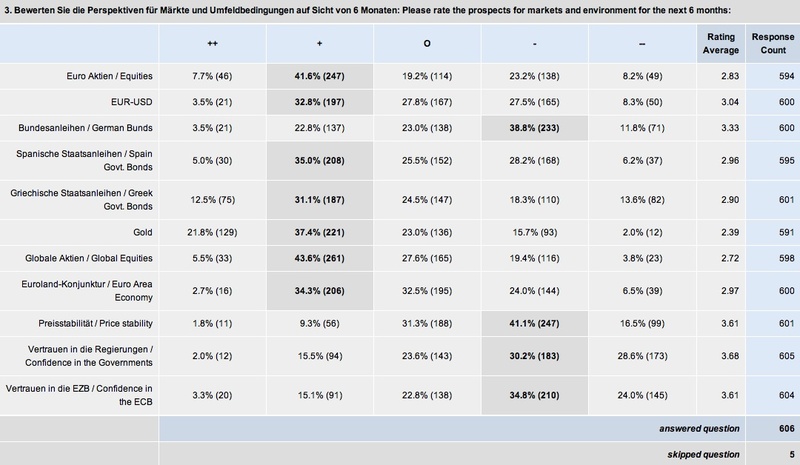 A special survey of 600 professional investors in Europe conducted Monday afternoon arrived at the worrying result that a majority of 59% has little to no trust in neither the European Central Bank (ECB) nor the Eurozone governments, raising fears that the next sell-off may be just around the corner. Surveymonkey.com published this brand new survey. A world wide web full with news on the €750 billion (roughly €2,500 per Eurozone inhabitant) rescue package for the Euro hammered out in a 14-hour meeting of EU finance ministers and agreed upon when Tokyo markets opened has failed to answer the most basic question: Where does the money come from except the taxpayers pockets? The EU Commission will fund a €60 billion programme whose payouts will be attached to stringent terms like that of the International Monetary Fund (IMF). 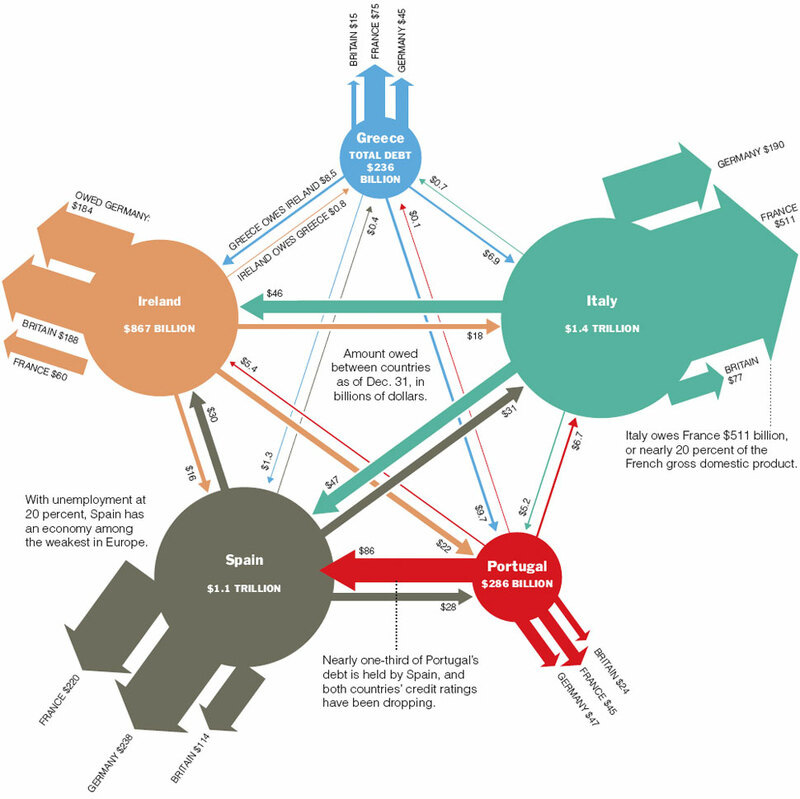 The Eurozone will guarantee another €440 billion in bailout money over the next 3 years on a pro-rata basis of the Eurozone members. There was no word from where this money will come from save for piling up more debts in the Eurozone. The Dow Jones Industrials Average recorded the biggest intra-day point loss with a temporary minus of 998.50 points or almost 10% due to persisting market woes about Greece, bringing down websites like Bloomberg and Zerohedge, which fired post after post. GRAPH: The Dow Jones Industrials plummeted 700 points in 20 minutes, only to regain 600 points in the following 20 minutes on Thursday. The chart does not display one candle but NYSE Euronext said there was no fast market. Click to enlarge. Chart courtesy of Yahoo. Speculation about the reason for this biggest ultra short-term move ranged far and wide. Listening to ECB President Jean-Claude Trichet who said default is not an option for Greece while the single currency attacked the $1.27 figure at the moment when he called it a safe store of value I cut my observations of the ECB council meeting here. Mr. Market seems to have a differing opinion. BTW, interest rates are on hold despite the latest uptick in inflation to 1.4%. I stumbled upon this ECB legal document that runs to the contrary and strangely has found no media attention. While promoting the Euro as a safe store of value the ECB opts for tight limits on cash transactions in Greece, limiting the role of cash Euros as a medium of exchange, one of the fundamental functions of a currency. Stating the objective to limit tax evasion the ECB recommends that all business transactions above €3,000 and all consumer expenses above €1,500 Euros shall be paid for in all other forms than cash. Heads Up: IMF and SNB Organize "High-Level Conference on International Monetary System"
Click to enlarge this table of mutual and external debts of the PIIGS countries and see at one glance that Greece was the smallest problem so far. I found this unsourced graph on Twitpic and cannot vouch for its accuracy. Following the downgrading of Greek government debt to junk status the European Central Bank (ECB) has done its part to keep Greek debt eligible as collateral for its liquidity providing operations by dropping all rating requirements. This is a remarkable step as the ECB bends its own rules that stipulate only investment grade debt is eligible as collateral. The suspension applies to all outstanding and new marketable debt instruments issued or guaranteed by the Greek government. This means that the ECB will accept all Greek issues regardless of their rating.